Order Online MySQL to Oracle Database Converter Software to convert multiple MySQL database records into Oracle database records with support of all data base key constraints, data types and attributes. 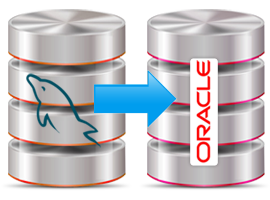 Click here to know how MySQL to Oracle Database Converter work. Click here to Download MySQL to Oracle Database Converter. Click here to read more about MySQL to Oracle Database Converter.